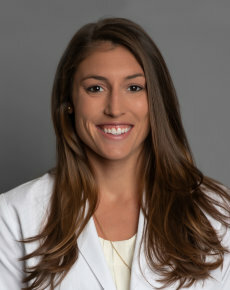 Sarah Hall joined OPA in 2019 as a physician assistant to Dr. Chad Patton, orthopedic surgeon, who specializes in spine surgery and serves as the Director of the AAMC Center for Spine Surgery. Sarah graduated from Salisbury University with Academic Honors. She volunteered as an EMT and worked in the emergency department in Salisbury and then Baltimore before attending the University of Maryland, Baltimore and Anne Arundel ARC-PA accredited Physician Assistant Program where she served as Vice President of her class. During her training, she completed a clinical rotation in spine surgery at Mercy Medical Center in Baltimore. She graduated with her Master’s of Health Science as a Physician Assistant. After graduation, she passed the national certifying exam. Following her education, she worked as a Physician Assistant in the emergency department at Doctor's Community Hospital in Lanham, Maryland where she cared for patients with a full spectrum of orthopedic conditions including disorders of the spine. Sarah works closely with Dr. Patton assisting in the office with new patient consultations, pre and post-operative evaluations, and follow-ups. She also assists with surgical cases. Sarah currently resides in Baltimore. She maintains a very active lifestyle and enjoys playing volleyball, surfing, and spending time with her family.